A travel carrier is an essential accessory for a bird owner. Whether it be for car trips, road trips or traveling by plane, your bird will need a comfortable and safe way to travel with you. Travel carriers do not need to be as big as your bird’s regular cage, but should be large enough for the bird to fit comfortably and move around a bit. Keep in mind the duration your bird will be in the carrier — for a shorter day trip, a smaller carrier is fine. For a longer trip the bird will spend one or more days in, a larger carrier is recommended. An ideal carrier for up to a week’s travel time for small to medium-size birds is the Poquito Avian Hotel. Depending on what type of travel you plan, there are many types of carriers available for your use. Airline approved carriers are a must for flight. Commonly used carriers include cat and dog carriers, modified to hold a perch and food dishes. 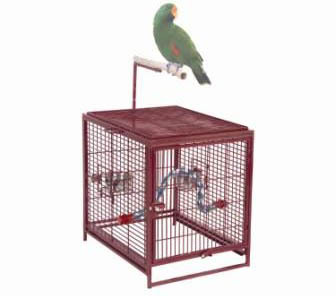 There are bird specific carriers available including collapsible wire carriers with grates and locking trays, heavy duty stainless steel carriers available for those with big beaks, highly durable easy-to-carry aluminum carriers, and even acrylic or polycarbonate carriers. For short trips hand held carriers that have a mesh front may be ideal and are suitable for smaller birds that aren’t apt to chew. Whatever your desire, there is a model available that will suit you and your bird. I personally chose a wire knockdown model that allows the carrier to be stored easily when not in use. A great space saver! Choose a perch that will provide firm footing for your bird. Stay away from slick woods like manzanita and choose perches such as rope. I recommend perches like grapevine, cholla, or rope that will allow your bird to have a good grip. A perch should be installed toward the front of the carrier to accomodate the birds tail. Also in case of a sudden stop the bird will not be thrown forward, but will be able to lean forward and grab the front of the carrier. When choosing a toy for the carrier select one made out of soft material, and preferably mount it on the side of the carrier so the toy does not move when the vehicle is in motion. Your bird should be comfortable and used to his carrier before any long trip. Putting his favorite toy and treats in the carrier will help put him at ease. Once he is used to his carrier it is advisable to take the bird on several short trips prior to the real trip. This will let you see how the bird reacts to the carrier and also to the trip. It is not uncommon for some parrots to experience car sickness, like my greencheek conure. If your bird does exhibit car sickness there are several things you can do to help ease the effects including: covering the carrier, trying the carrier in both the back and front seats of the car(safely buckled in), and if all else fails offering shredded ginger root prior to the trip can help ease any stomach upset. Be sure to always secure your bird’s carrier with a seatbelt or other device. Like little children, a bird in a front seat could be vulnerable to injury if there was an accident and air bags were deployed. Also be sure to bring adequate food and water for your feathered companion. It is recommended that providing juicy fruit or an ice cube will replace water on a short journey, as the bird will still recieve necesarry liquids without worry of water spilling. On extended travels your bird will need out of cage time, so a portable playgym or T-stand is recommended. There are several models available that break down making it easy for you to carry. Before vacation day, it is recommended that you make sure your bird has been properly groomed. While some articles say that your bird requires a health certificate before any travel, this is largely untrue. If you are driving with your pet you will not need to provide proof of health inside the US. If you are flying or traveling by other means it is required that you have a recent (within 30 day) health certificate for all animals. If your bird is fully flighted, a harness for the journey is necessary to ensure your bird will not escape. I personally chose to clip all my birds prior to travel, as I want to be able to grab them quickly without worrying about putting on a harness in an emergency. Always keep safety in mind while traveling. Keep your bird in the carrier while the vehicle is in motion. Climate and altitude changes can affect your pet so be sure to have weather conditions checked ahead of time. It is best to avoid crowds and never let your bird out of your sight. It is also advised to reserve your hotel ahead of time, so that you can be sure the place you rest is pet friendly. I found that Drury Suites Hotels were very accomodating and pet friendly. It is also recommended that you bring along emergency contact numbers of both pet sitters and your avian vet. Carry your avian first aid kit, in case of an accident. Documents such as proof of ownership, breeders name/address, medical records, and a recent photo of your bird is recommended. Some owners have taken a further step and also microchipped their avian companions. If you have done this be sure to have the chip’s information in a safe place, and take it on your travels. The chance that you will need all this documentation and information is slim; however, the information would prove invaluable in case of an emergency.